The club have been saddened to learn that former committee member and fan William ‘Bill’ McAdam has passed away. Bill who was a native to Annan, stayed in Edinburgh and served the club as a committee member. During this spell he represented the club at our East of Scotland association meetings and became a friend to many clubs and their respective officials. Bill pictured on the right is en route to an away game with friends George Willacy Jnr (left) and Jim Byers (centre). 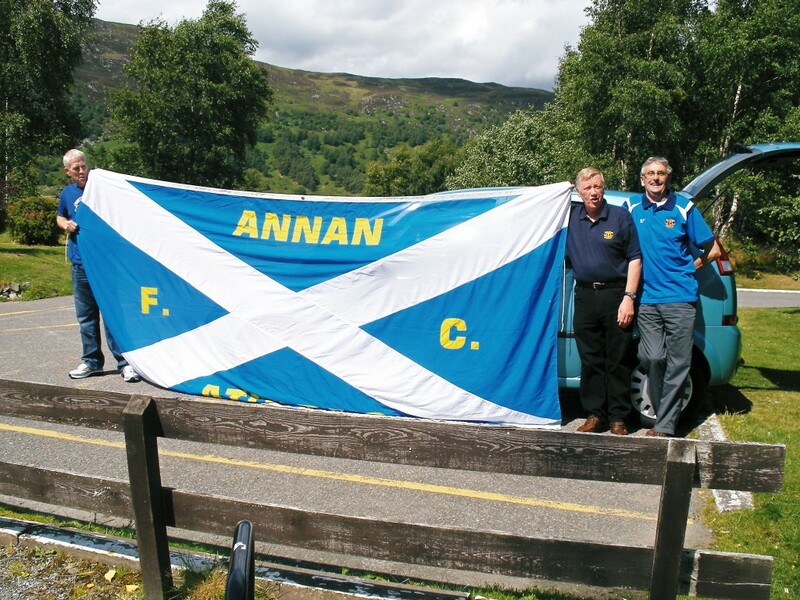 It was his passion for Annan Athletic that would see him introduce friends Peter Robertson, Jim Byers and Graeme Byers to the club. The fans along with Bills son David and George Willacy Jnr would support the club home and away during our East of Scotland days and then as an SPFL club. Bill was present at our most recent home game against Elgin City where in his usual cheery self he’d brought another two friends down to support the club and with it sample the friendship that he’d come to enjoy. The club sends it’s heartfelt condolences to Bills family and friends and details of his funeral arrangements will be posted later.